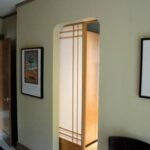 Expert guide for buying a pocket door, including where to use one effectively, the benefits, construction, and installation basics. As the cost of buying, building, and remodeling houses continues to skyrocket, architects, home builders, and homeowners seek strategies to get more from less space. In the world of home building, space is money. 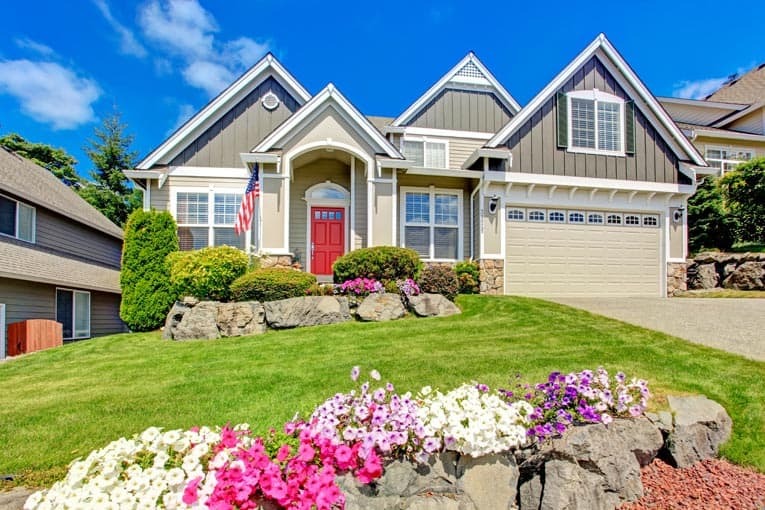 Building a new home or adding onto an existing house typically costs $150 or more per square foot. Add the costs of heating, cooling, and maintaining that space and it’s easy to see that every inch counts. This is where doors that disappear enter the picture. 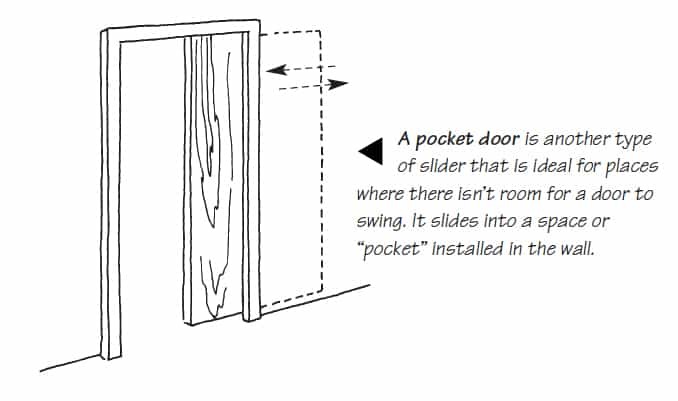 Rather than swinging like a hinged door, a pocket door slides into a hollow cavity, or “pocket,” in the wall. A type of sliding door, it consists of a conventional door mounted on rollers that glide along an overhead track. When using a pocket door, the space normally required for the door’s swing, which can total 10 square feet or more, becomes usable, unobstructed floor space. This type of door doesn’t just save space—it can also solve problems, particularly in tight spots. For example, a pocket door might be used in a small half-bath that simply doesn’t have enough space for a door to swing in or out. 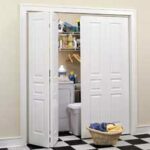 There, use of a pocket door could eliminate the need for building an unnecessarily large bathroom or stealing space from an adjacent closet or similar area. This is a big payoff! 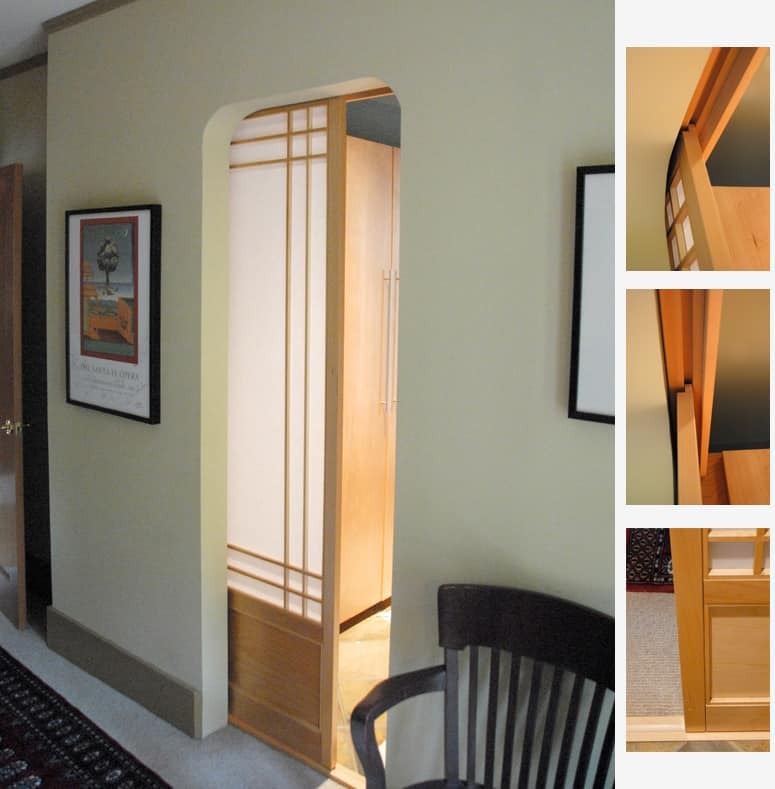 Custom-made lightweight Shoji-screen-style pocket door with translucent panels glides into the wall along waxed hardwood runners. Top two details at right show door’s rabbeted top edge; bottom detail shows door’s base runner. Another typical spot for a pocket door is where a regular door has room to swing, but where it would be in the way when open. This situation is common in bathrooms, closets, and laundry rooms. Almost anywhere an open door would become an obstacle, a pocket door may make sense. For a large, double-wide doorway between two rooms—a dining room and living room, for example—a pair of pocket doors can serve elegantly and practically. When closed, they separate the two spaces. When open, they combine two rooms into one. This is a classic setup that has been used for a couple of centuries. Unlike swinging doors, pocket doors don’t clutter or obstruct the area around the doorway when left open. Today’s pocket door hardware is far more advanced than that hardware previously installed on older doors. Older types ride on steel rollers that are noisy, balky, or jump the tracks. Today’s systems have smooth, quiet, axle-mounted nylon or ball-bearing rollers and metal tracks designed for smooth, trouble-free operation. 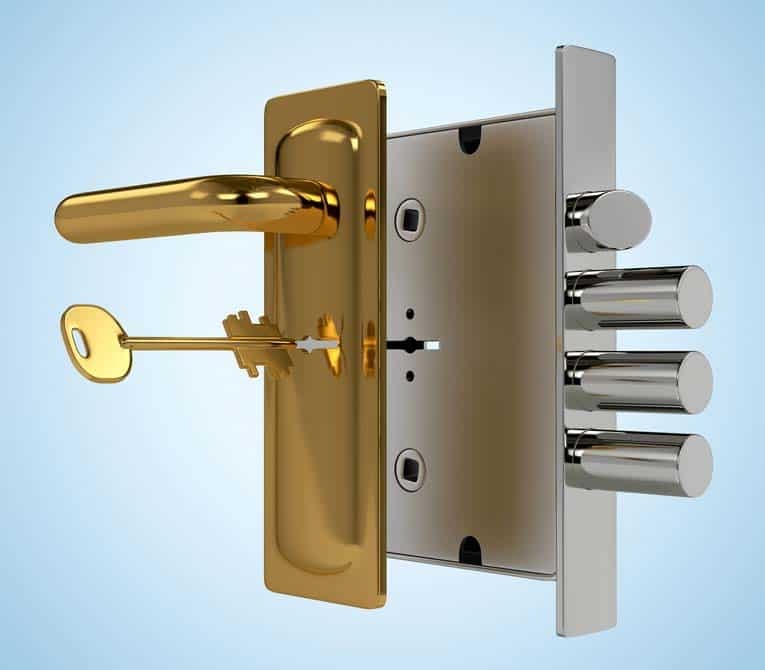 And you can get types with soft-closing hardware, as discussed below. Nearly any type of door—flush, panel, louvered, glazed—may be mounted on pocket door hardware as long as the hardware is rated to handle its size and weight. Most hardware will hold 1 3/8- inch-thick hollow-core doors weighing up to about 75 pounds. You can buy a pocket door frame with heavy-duty hardware that will support 1 3/4-inch-thick solid-hardwood doors weighing up to 175 pounds. 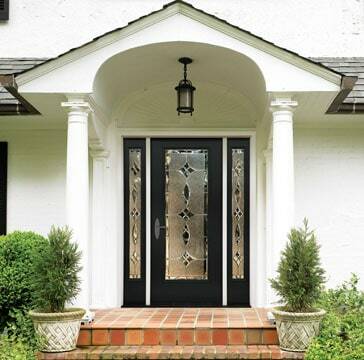 In fact, you can even buy hardware that will hold very heavy glass doors. 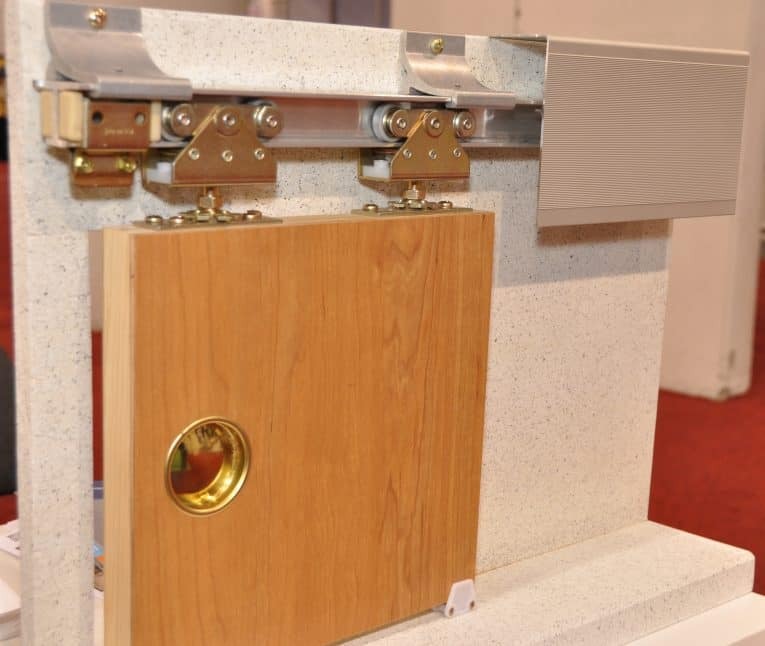 This display shows how side-mounted heavy-duty pocket door hardware works. This can handle interior “barn doors,” too. A single manufacturer may offer several options; for example, Cox Hardware makes different roller/track combinations for a variety of door sizes and weights. Pocket door systems are offered either as kits or as pre-assembled units. The pre-assembled types, sold through lumberyards and home improvement centers, include a pocket door frame and jamb, hanger track, and pre-made cage that, when finished, becomes the pocket. The cage is framed with lightweight lumber, yielding a weaker wall than a conventional 2-by-4-framed wall. The installer just fits the unit into a pre-framed rough opening, fastens it in place, applies the wall surface, finishes the opening with casing trim, and then hangs the from the track. The kit type requires only slightly more installation effort. Steel-reinforced split studs reinforce most types. Also, because kits are knocked down into flat packages, they’re easier than pre-assembled types to transport and handle. One of the larger manufacturers, Johnson Hardware, makes a cut-to-length universal frame parts. This includes header, fully steel-reinforced split jamb and stud uprights, and removable track hardware. 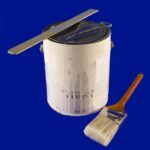 The kit fits into a pre-framed rough opening, allowing for very fast installation . Complete instructions make installation of a kit a manageable job for do-it-yourselfers. Standard sizes provide for doors up to 3 feet wide and 6 feet, 8 inches tall. You can special-order other systems for larger doors. Pocket doors can be noisy to open and close, but Johnson Hardware offers “Soft-Close Hardware” that works like a cabinet door closer to open and close doors softly and quietly and prevents pinched fingers. Designed for both new and existing pocket doors, it can be installed easily in less than an hour as shown in the following video. Because the hardware for a pocket door goes inside a wall, when installing a pocket door, you should make every effort to avoid problems that could occur some time down the line. 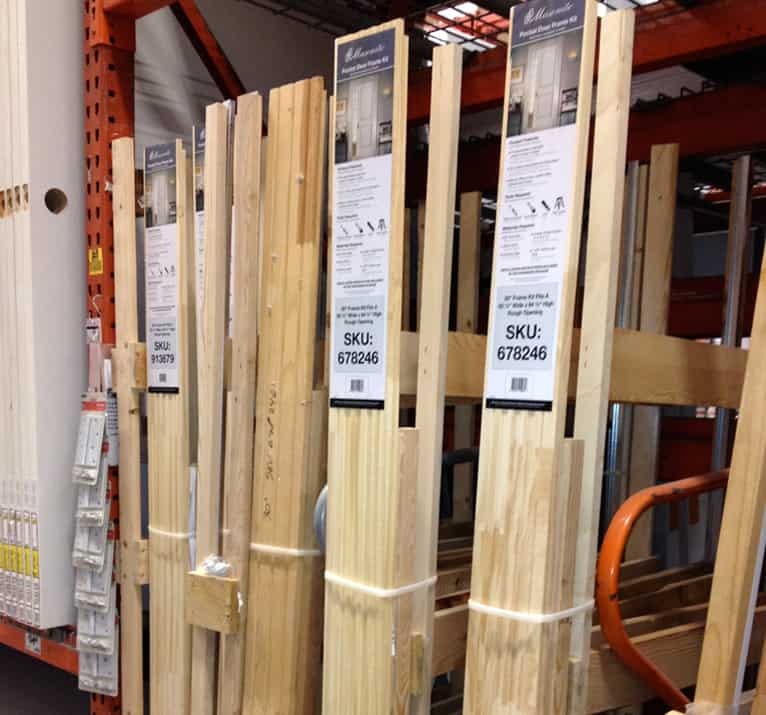 Buy quality hardware that matches the weight and size requirements of the door. Choose rollers that won’t jump the track. In fact, you might want to opt for the type that can be released from the door with a flip of a small lever. Also look for a track that you can remove without having to tear out the walls in the event that it has problems. Hire a qualified installer or, if you do the work yourself, follow all best practices and don’t compromise a load-bearing wall. Be sure the header is level and side jambs are plumb. Allow a 3/16-inch clearance between jambs and door so that, if the door warps slightly over time, it won’t bind in the jambs. And last but not least, take care in painting both the door and jambs to avoid paint buildup that could cause the door to stick. The following video offers a very helpful overview of the actual steps required for installing a pocket door in new construction.